* with one application of this hair mask, you will notice a remarkable decrease in your hair shedding but consistent use will further reduce the amount of hair shedding (considering other factors that may be causing your thinning hair are also been taken care of). No one wants to wake up and see that they are losing hair at a very fast rate. Even though we all lose hair every day, shedding more than 100 strands of hair is said to be excessive. 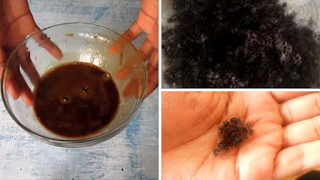 However, there are some homemade remedies that are effective in delaying the shedding phase of hair. Coffee contains caffeine and caffeine has been said to be effective in shortening the shedding stage of hair thereby resulting in less hair fall. It blocks dihydrotestosterone which is a hormone that elongates the shedding stage of hair. Therefore blocking the action of this hormone results in less hair fall and thinning of the hair. A topical application when done on the hair or scalp, it finds its way to the roots and stimulates them. it finds its way to the roots and stimulates them. Coffee also stimulates the hair roots by improving its structure and growth. Caffeine can thus restore hair growth and/or prevent hair loss. Coffee makes the hair shaft stronger and smoother, making it easier to manage while giving it a natural sheen. Remember to rinse off with cool water and to follow up with a very moisturising deep conditioner to balance the protein treatment. This treatment should not be done every week else your hair will break due to protein overload. It should be done once a month for best results.